Yogyakarta: Vietnam’s Thai Son Nam opened their AFC Futsal Club Championship Indonesia 2018 campaign in fabulous fashion, beating Jeonju MAG FC of Korea Republic 10-1 at the Gor Amongrogo on Wednesday. Less that two minutes into the match, Nguyen Minh Tri scored Thai Son Nam’s first goal with a superb strike, courtesy of a deflected pass from Abdulrahman Al Tawail. Despite the early goal advantage, Miguel Rodrigo’s charges took their time with the ball and played cautiously but pressuring Jeonju into a defensive formation. Thirteen minutes in, Thai Son Nam showed their prowess with set-pieces as Minh Tri’s corner kick saw the ball sailing into the danger area, and Roberto Tobe took advantage of the scramble to tap home. In the final minutes of the first half, Jeonju showed sparks of life as they looked to reduce the two-goal deficit, but Thai Son Nam held their nerves. Lee Young-jin’s side returned in the second half more spirited and aggressive, with skipper Shin Jong-hoon coming close in the 22nd minute when he released a crackling shot but it struck the upright. Just moments later, Thai Son Nam furthered their advantage through another corner set-piece, with Pham Duc Hoa scoriing. An unruffled Jeonju continued to pile on the pressure, forcing Thai Son Nam into making mistakes in their own half, and less than a minute later, Cho Byung-girl etched his name on the scoresheet through a corner set-piece of their own. In the 25th minute, Thai Son Nam were given a free-kick near the second penalty spot after Jo Du-hee’s rough tackle on Tobe. Al Tawail stepped up to take the free-kick, making no mistake as he drove the ball into the bottom right corner. Ton That Phi and Minh Tri showed tremendous teamwork with their synergy, and their partnership paid dividends moments later with Minh Tri scoring his second. Vu Duc Tung, Tran Van Vu and Ngo Ngoc Son found the back of the net in the 28th. 29th and 34th minutes respectively to put Thai Son Nam in a comfortable position. Al Tawail made it 9-0 with three minutes left on the clock with his perfect volley, before That Phi ended proceedings with his second goal of the night. Thai Son Nam will look to continue their fine form as they go up against Iraq's Nafit Al Wasat, while Jeonju face United Arab Emirates' Al Dhafra on August 3. Yogyakarta: Vamos FC kicked off their 2018 AFC Futsal Club Championship campaign in style when they beat Victoria University College FC 8-1 at the Gor Uny on Wednesday. It was an explosive start for both teams as Vamos, playing in front of their home fans, fought for an early foothold in the opening minutes. Vamos had an early chance of scoring and came close when Anzar pulled his shot wide at the left side of the post. The home side kept the pressure on Victoria University College and were rewarded after five minutes of play when Al Fajri Zikri’s sharp turn left his marker rooted on the left flank and he scored from the edge of the penalty box. Two minutes later, Dennis Guna Bawana doubled the advantage when he converted a square pass after some good work from Bagus Himawan down the left. Vamos added intensity in their attack when they brought in Papua New Guinea import Adolfo Christian Yembise and were rewarded with a third goal in the eighth minute. Himawan calmly beat Victoria University College goalkeeper Zaw Myo Htike after capitalising on a defensive error as Vamos sat comfortably in front. Anzar added Vamos’ fourth in the 11th minute after his low drive from the right flank beat Victoria University College’s defence and goalkeeper Zaw. Four minutes from the break, Nandi Sumawijaya found himself in open space and scored a beautifully executed back heel which drew applause from the fans. Victoria University College came strongly off the blocks in the second half as they pressed the home side high in their own half. Their patience paid off as substitute Naing Lin Tun Kyaw pulled one back for the visitors with 11 minutes to go. Vamos replied two minutes later when import Marvin Alexa Wossiry made it 6-1 off a counter attack while Himawan picked up his second of the match to give them their seventh goal. With a minute to go, Anzar could have made it 8-1 but his penalty was saved by Zaw. Iqbal Aliefian added the icing on the cake when he scored from the top of the penalty box to give the hosts a comprehensive victory. Vamos will face China PR’s Dalian Yuan Dynasty FC next on Friday. "This was the first match in the competition and it was tricky for Vamos as we are playing at home in front of the home fans and we did well. Victoria University College is a good team and Vamos got the win. Sometimes we can play very badly but today we beat a good team. I think all my players did well today especially our goalkeeper Mostafa and I'm proud of them." "We lost against a better side today, I'm proud of my players as most of them are young and It's important for them to get the experience. Vamos captain Syahidansyah Lubis was exceptional today. I think he was the best player for Vamos." Yogyakarta: Nagoya Oceans showed their class, defeating Dalian Yuan Dynasty FC 6-1 in their opening AFC Futsal Club Championship Group C tie at the Gor Uny on Wednesday. The three-time AFC Futsal Club champions applied pressure early on, testing Dalian goalkeeper Feng Xiaoyu with a barrage of shots but the Chinese custodian was up to the task as he parried them all. Dalian kept it tight at the back and matched Nagoya’s physical strength and held on for as long as they could. But their resistance finally broke in the 10th minute when Hashimoto Masaya found space in the middle and sent a blistering shot past Feng. Nagoya doubled their lead in the 15th minute when Yoshikawa Tomoki collected a square pass from the right to give the Japanese side a 2-0 advantage. With four minutes left in the half, Dalian activated the power play and Wang Hongwei forced Nagoya goalkeeper Yushi Sekiguchi into making his first save of the match. Masaya claimed his second of the match two minutes after the restart when he blasted his effort from the top of the penalty box off a corner. Luiz Fernando Cardozo made it 4-0 four minutes into the second half after some slick exchanges found him space in the penalty box as he tapped in from close range to give Nagoya a commanding lead. Dalian tried to force their way past Nagoya but their efforts fell flat as the Japanese were well organised. Cardazo then added Nagoya’s fifth with seven minutes left after connecting from Kiyoto Yagi’s cross as he left Feng without a chance. Dalian scored their consolation with a minute left to play when Shen Siming made no mistake from the spot to beat Nagoya goalkeeper Sekiguchi. Nagoya however made it 6-1 in the final seconds of the match when substitute Ryohei Ando tapped in from close range. On Friday, Nagoya will face Victoria University College while Dalian will take on hosts Vamos FC. Nagoya Oceans Head Coach Pedro Costa "It was a very physical game from the start of the match. Playing against a team like Dalian is always very difficult as we didn't know what to expect. They are a good side and we did our best. In our next match against Victoria University College, we want to be in control from the start and maintain our good run." Dalian Yuan Dynasty FC Head Coach Lee Jian Lei "Today was the big chance for my players to play a huge team like Nagoya and this was the biggest obstacle for us. It was a great exposure for my young players. For the next match against Vamos, I believe it will be even harder. My players followed my instructions and I will use the same formation against the Indonesian side." Yogyakarta: United Arab Emirates’ Al Dhafra and Nafit Al Wasat of Iraq played to a 1-1 draw in Group B of the AFC Futsal Club Championship Indonesia 2018 on Wednesday. In the all West Asian affair, both sides applied pressure from the start and were equally matched in possession and attempts on shot. Nafit’s Farhad Tavakoli came close in the opening minutes but his left-footed shot struck the crossbar. Thirteen minutes in, Nafit reacted with a counter-attack that saw Tavakoli and Ghodrat Bahadori unmarked in opposition territory, but Bahadori failed to connect a crucial pass in the box. By the half-time whistle, it was clear that the man of the match for both teams were their goalkeepers, Al Dhafra’s Hassan Ali Al Hantoobi and Yahya Abdulnoor Raheem of Nafit, who were outstanding in safeguarding their goal. The high-tempo game continued with man-on-man marking keeping both sides on their feet, but in the 24th minute Mohamed Abdulla Fadaaq outmuscled Nafit’s Mustafa Bachay Hamzah in front of the box and hit home to break the deadlock. Al Dhafra pushed to further their advantage, knowing an opening day win would lay the foundations of reaching the quarter-finals, and a minute after the half-hour mark, Mohammad Obaid let loose a left footed volley but was denied by ‘keeper Abdulnoor Raheem. Nafit, the 2016 runners-up, kept prodding with attempt after another and their efforts finally paid off in the 34th minute when Hasan Ali Jabbar headed the ball in from close range, courtesy of Bachay Hamzah’s pass into the box to level the scores. The scoreline was not reflective of the action-packed game at the Gor Amongrogo, and in the final minute, Nafit committed their fifth foul but Al Dhafra failed to take advantage of it, as both sides shared the spoils. Next up, Al Dhafra will take on Korea Republic’s Jeonju MAG FC, while Nafit face Thai Son Nam FC of Vietnam on Friday. "We are sad cause it ended 1-1. It was a difficult match but we must be thinking of the next match and we must be the winner. It will be difficult going up against the team from Vietnam (Thai Son Nam). We are in a difficult position. I will push my team because we need to win the next game." "Today our team had good concentration in defence and counter-attack. We had a lot of chances and our team had really good fitness, but I am extremely happy because all the players gave me more than a 100 percent today. The next game is another problem, but it's still important to win the second game. If we win, we will have a good chance to finish group winner or runners-up." Yogyakarta: Suphawut Thueanklang is not worried about having a target on his back as Bluewave Chonburi embark on their quest to retain the AFC Futsal Club Championship in Yogyakarta. Bluewave Chonburi will open their title defence against Australian side Vic Vipers on Thursday and Thueanklang said the Thai champions are ready. “We have just returned from our training camp in Japan and we are ready for the competition. “Of course I will be under pressure as we won our second title last year. Every team will keep an eye on us. It will be tough games ahead but I will do my best." Thueanklang scored a hat-trick in last year’s final, beating Islamic Republic of Iran’s Giti Pasand Isfahan 3-2 and the 2013 AFC Futsal Player of The Year is confident of defending the title in Yogyakarta. 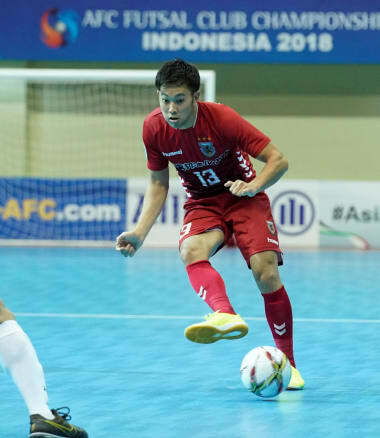 Yogyakarta: Hashimoto Masaya scored twice for Nagoya Oceans but said his opener against Dalian Yuan Dynasty FC was crucial for the 6-1 win in their AFC Futsal Club Championship 2018 Group A tie on Wednesday. “The most important thing is the three points and we faced a lot of pressure in the first game as we wanted to win the match. The opening goal was very difficult for us as Dalian were well organised. “We tried and tried and it was hard but I managed to change that when I came on as a substitute and it was a good feeling. I did a good job for my team and the goals were very important for Nagoya," said Masaya. Masaya played a vital role in breaking down Dalian Yuan Dynasty’s defence when he sent a screamer past goalkeeper Feng Xiaoyu for the opening goal as Nagoya then scored another to take a 2-0 lead at halftime. The forward was at it again two minutes after the restart when he scored off a corner to make it 3-0. Nagoya play Myanmar's Victoria University College next on Friday.